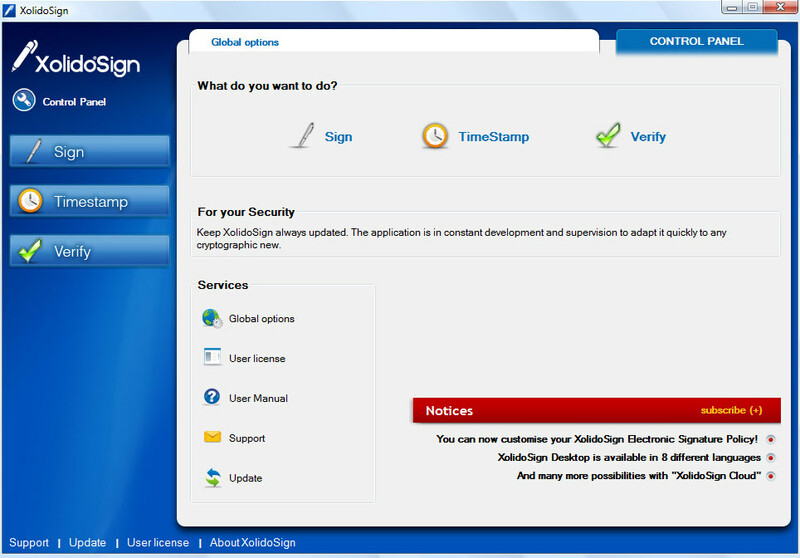 Last Updated: 6/12/2018 | File Size: 16301 KB | License: Freeware | Downloads: 319 | Developer: Xolido Systems, S.A.
XolidoSign allows you to perform advanced digital signature (CadES) and/or timestamp for all the documents you need (PDF native Signature, Word, Images, Excel datasheet, Databases, Videos ). XolidoSign performs a verification of your received signed documents. With an an automatic process of pairings and associations between files, electronic signatures and time stamps, returning validity status of signatures, time stamps and files. On your computer. Easy, Fast and for all users. Statement: First, please download the orginal installation package by clicking the download link. Of course you may also download it from the publisher's website. Using XolidoSign crack, key, patch, serial number, registration code, keygen is illegal. The download file hosted at publisher website. We do not provide any download link points to Rapidshare, Hotfile, Depositfiles, Mediafire, Filefactory, etc. or obtained from file sharing programs such as Limewire, Kazaa, Imesh, Ares, BearShare, BitTorrent, WinMX etc. Software piracy is theft. If you like XolidoSign please buy it.